Rabbi Dr. Yosef Kalinsky earned his BA in economics at Yeshiva College, his master’s in education at Azrieli Graduate School, his masters in social work at the Wurzweiler School of Social Work, and his semikhah at RIETS, where he subsequently was a fellow in the Bella and Harry Wexner Kollel Elyon. 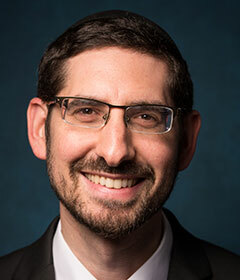 He was just named dean of the men’s undergraduate Torah studies program at Yeshiva University. Rabbi Kalinsky is also an adjunct professor of halakhah in the Isaac Breuer College at Yeshiva University. 1. What profession did you think you would hold when you were a YU undergrad? Throughout adolescence and young adulthood I had assumed that I would become a teacher. I enjoyed learning Torah and found opportunities to share with others what I had learned from a young age in both shul and camp settings. During my years at Shaalvim and as an undergrad those aspirations grew, as did my formal and informal teaching experiences. I enrolled in Azrieli Graduate School as a senior in college in the joint BA/MS program and continued coursework the following year while I was also enrolled in RIETS. 2. What aspect of your job with YU do you most enjoy? YU is an exciting place to work! On a typical day I have the opportunity to interact with world renown roshei yeshiva, wonderful students, administrators, support staff, security….each of them offer a unique aspect to our campus. The times I enjoy most are my meetings with students. It is most enjoyable when I will meet with a student to help him figure out his schedule or to choose a rebbe and he comes back a few weeks later and tells me how much he loves learning with that particular rebbe. 3. What would you consider some of your YU successes? With the help of my colleagues, the undergraduate experience here has improved in many areas over the last number of years. We have a system of hashgacha that helps up keep track of how the talmidim are doing. We placed a greater emphasis on programming for talmidim in the evenings and over Shabbos, adding additional chaburos and shiurim. Rebbeim are encouraged to have talmidim over in their homes at least twice a year and often address contemporary topics with their shiurim. I was instrumental in beginning the BA/Semicha program four years ago and today, Baruch Hashem, more than 20 undergrads partake in an afternoon seder under the guidance of Rabbi Tanchum Cohen. 4. What are some of your goals for Undergraduate Torah Studies at YU and what progress have you made? My current goal is to build upon the excellent and diverse shuirim that we offer and emphasize across all programs with all rebbeim the need to also focus on forging a meaningful relationship with each of their talmidim. These relationships will help students chart and prepare for their next stage in life. We are also placing more time and energies into preparing seniors for “life after yeshiva” by organizing courses, shiurim, and chaburos on topics related to helping prepare and transition talmidim as they enter the workplace or graduate school. I have been an active member of the local community board in Washington Heights and Inwood (CB12 Manhattan) for the past 10 years and am a past chair of its traffic and transportation committee. Through my work on the board I have forged relationships with our elected officials and have been called upon to offer benedictions at formal inaugurations. I even hosted a parlor meeting in my apartment for our local council member!